Several studies have suggested that there’s a link between the holiday season and overeating that leads to weight gain. A recent analysis of data found that the last week of November to the first or second week of January is a critical time when many consumers gain weight. Researchers say that most adults are bound to pack on a few pounds around the holiday, even if they’re seeking to lose weight and are self-monitoring their eating habits. However, some health experts don’t necessarily agree. In an interview with ConsumerAffairs, nutritionist Allison Bradfield said that it’s important to be careful about which holiday foods you allow yourself to enjoy, since certain staples can lead to unintended weight gain. She points out that some classic holiday foods can be diet downfalls, but others can be healthy when enjoyed in moderation. Bradfield says some of the least healthy holiday foods include creamy dips, casseroles, and pecan pie. But other traditional holiday foods — such as sweet potatoes, cranberries, pumpkin, and fresh green beans — can offer health benefits, especially when prepared via simple cooking methods such as roasting, baking, or steaming. Sweet potatoes. Sweet potatoes are loaded with vitamins, minerals, and antioxidants and have just 113 calories per half-cup. Since they’re naturally sweet when baked, you won’t need to add sugar, butter, or marshmallows. Instead, add a sprinkle of cinnamon and nutmeg. Pumpkin. Pumpkin pie is a better choice than pecan pie (which can have up to 800 calories per slice), says Bradfield. Pumpkin is lower in fat and calories and also provides a good dose of beta-carotene. Another way to cut calories? Avoid the crust. White turkey meat. Lower-fat white turkey meat is healthier than dark meat smothered in gravy. Bradfield says the healthiest way to enjoy white turkey meat is without the skin and with just a drizzle of gravy made with defatted pan juices, dry white wine, and low-sodium chicken broth. Hot cocoa. Instead of egg nog (which can have up to 500 calories a cup), Bradfield recommends warming up with a cup of low-fat dark chocolate hot cocoa. Lower-calorie spirits. Wine spritzers and light beer have fewer calories than mixed, sweetened alcoholic beverages. Since alcohol is a high calorie drink, Bradfield recommends setting a limit on the number of alcoholic beverages you allow yourself to have. Drinking water between beverages can also help prevent overindulgence. 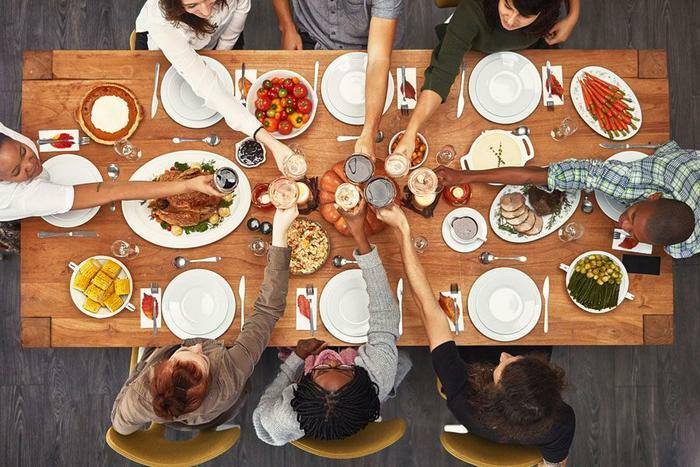 To avoid consuming excess calories this holiday season, take a mindful approach when eating. Listening to your body can help you avoid overindulgence.